Freestyle skiing has a short history in the Winter Olympics, but has fast become one of the Games’ most popular sports. The image of athletes soaring through the sky, twisting and turning their skis and poles while airborne, is indelible and eye-pleasing. To help keep sports fans in an Olympic frame of mind, the United States Sports Academy currently has on display a series of posters featuring the Vancouver Winter Olympic Games, including one on freestyle skiing. 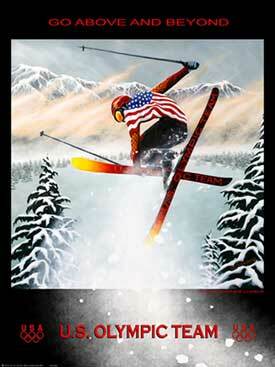 The series includes such notable artists as: LeRoy Neiman, the American Sport Art Museum and Archives (ASAMA) 2007 Sport Artist of the Year; actress Jane Seymour; and Susan Sommer-Luarca, the commissioned Official Artist for the 2010 U.S. Olympic Team whose piece on freestyle skiing, “Go Above and Beyond,” is featured in the collection. The Winter Olympics series is just part of the Academy’s collection devoted to the Olympics. Pieces in conjunction with both the Summer and Winter Games are also on display. ASAMA is free to the public and open from 9:00 a.m. to 4:00 p.m. Monday through Friday.